It’s finally October! The endless days of blistering heat have been replaced, for the most part, by shorter days and cooler evenings. And, naturally, that’s got us thinking about packing up our gear and going on a weekend camping trip! 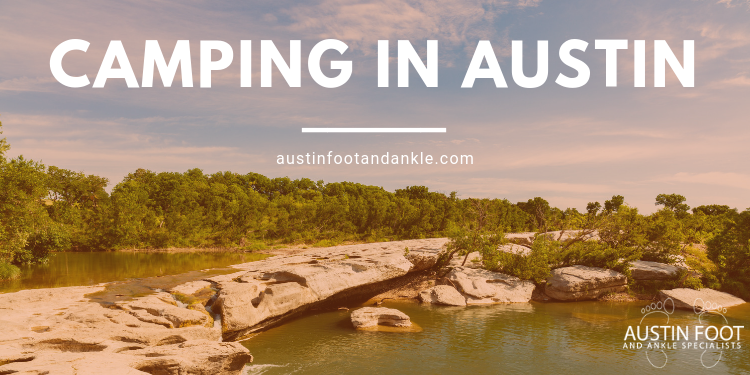 After all, the Austin area isn’t exactly lacking in stunning natural beauty, awesome campgrounds, and great places to set up a tent, do some cooking over an open fire, or go exploring! Maybe your preference is to find a little spot out in the middle of nowhere, all to yourself. Or maybe you’d rather go someplace where the electrical outlets, flush toilets, and access to all the wonderful conveniences of home are plentiful. Either way, you’ve got options. Here are a few of our favorites. It really is astounding that a place like McKinney Falls State Park even exists. You’ll find more than 700 acres, beautiful waterfalls, several natural pools for swimming, miles of hiking trails, and more—all within the city limits! Campsites are spacious, shaded, and offer hookups for both water and electric. Fees are also extremely reasonable, at $6 per day entry and around $20 per night if you’re camping. Since it’s only 15 minutes from downtown, McKinney Falls also makes a great spot for easy day trips. That said, do try to go earlier in the day to avoid lines and even ensure entry—it’s not unusual for the park entrance to close if capacity limits are reached. Weekend campsite reservations do fill up fast, too. Of course, McKinney isn’t even your only option purely within the city limits. Sure, camping purists will probably prefer something a little more rugged and isolated, but Emma Long Park is a great choice for families and groups—especially if you’re bringing young children or pets along. Rugged sites without utilities are available, as well as premium sites with water and electric—including some right on the waterfront. You’ll enjoy the sandy beach and shallow swimming waters, watching boats from the piers, accessible hiking trails, volleyball and basketball courts, and more. Inks Lake is a little bit further afield, about 70 miles or so from downtown Austin. But trust us: it’s well worth the trip. Campsites range from the super-rustic to spaces with all the bells and whistles, so you can choose the level of “sophistication” that suits you best. A word of warning, though: despite its remote location, Inks Lake also fills up pretty fast, too. Book your reservations as early as possible, especially if you’re eyeing a weekend stay. There’s something, well, enchanting about this place in the Texas Hill country. In fact, it was picked as the “best campsite” in all of Texas in a 2017 MSN.com survey. And if you love the night sky (and who doesn’t), you’ll be pleased to know that Enchanted Rock is one of the best places to catch a glimpse of the Milky Way, according to the International Dark Sky Association. All camping here is strictly tent only. The “walk in” sites close to the front have potable water and restrooms with showers accessible nearby. The two primitive backpack sites surrounding Moss Lake and Walnut Springs require a few miles of rugged hiking to access, and do not permit ash-producing ground fires (only containerized fuel stoves). However, they do have composting toilets—and by far the best view of the night sky. 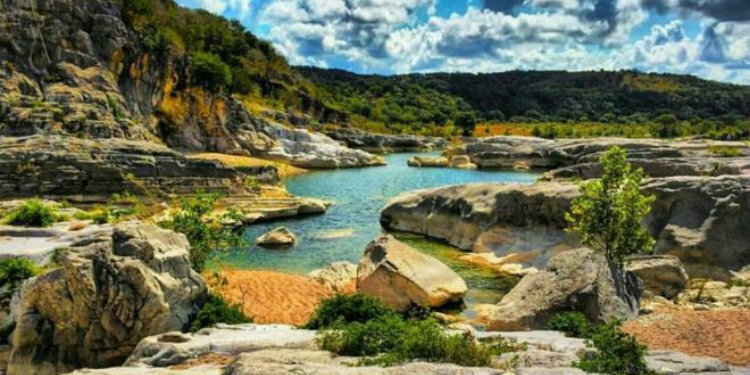 At more than 5,200 acres, there’s always something new to explore at Pedernales Falls State Park—no matter how often you visit, or how long you stay. Take a dip in the river, go fishing, tackle the more than 20 miles of hiking and biking trails, or just sit back, relax, and enjoy your surroundings. The park’s expansive terrain covers woods, grassland, rocky hills, and more—with gorgeous waterfalls, caves, and all kinds of animal life (including wild deer and turkeys) to explore. There are even equestrian trails—though you do have to provide your own horse. Most sites feature water and electric hookups, though more primitive spots are also available. One quick word of caution—exercise care when swimming in the river, especially with children. Flash flooding can turn serene waters into dangerous torrents in a matter of a few minutes. If you love fishing and prefer “roughing it” when you camp, this gorgeous little area along the south end of Granger Lake in Taylor is absolutely for you. And when we say “roughing it,” we mean it. The 8-site campground in a shaded, grassy grove is only accessible via a 3-mile hike or by boat, so you’d better be ready to carry all your own gear! You get a composting toilet (well kept), central fire pit and a couple of picnic tables, and that’s about it. You’ll have to bring your own water, too, since nothing potable is available on site. Those who do make the effort, however, will be treated to stunning views, spectacular fishing, good hiking trails, and restful isolation. Stay Safe and Have a Good Time! It goes without saying that you’ll get the most enjoyment out of your camping experience if your feet and ankles are in good, working order. You can forget about that trek to the top of Enchanted Rock or ambitious backpacking route if your feet want to quit less than halfway through. Helping you prevent injuries and manage your risk—sometimes simply by recommending a good pair of shoes. Or, we might fit you for orthotics, sports braces, or other tools that protect your feet and ankles during activity. Providing any emergency care that may be needed after an unexpected injury promptly, professionally, and with a high level of quality. We are always happy to see you, and love getting you back on your feet again—so you can explore the world and live your best life, wherever your feet take you. Scheduling is easy—just give us a call at (512) 328-8900 or contact us online.